Strong study skills will help you in class and at home. Strong study skills can help a poor student succeed, just as poor study skills can allow a gifted student to fail. If you devote as much attention to your study strategies as you do to the material itself, you will give yourself more opportunity to excel in your coursework. Time management is an important study skill, but it won't help at all if you wait too long before you even begin studying. Get at least a little studying done the day class work is assigned, even if it's simply writing up a study plan. Before a lecture begins, read all of the lesson's text, review the syllabus and anticipate how the lecture will be organized. While the teacher lectures, jot down notes about the main points in your own words. Immediately after class -- or at your earliest convenience, re-read your notes and fill in the information you had to leave out during class so you could keep up with the speaker. Re-reading could keep you from forgetting more than fifty percent of the information you learned, according to Princeton University. You can even re-write your notes entirely so you can thoroughly develop your understanding of the ideas. 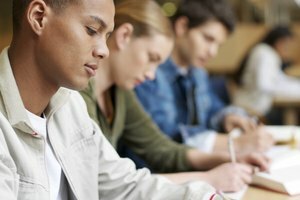 Take a study skills survey, or write a list of study skills and rank yourself according to how well you demonstrate each skill. Afterward, you can give special attention to improving your weaker skills. Student life often competes with personal and professional life. Use a planner to keep track of your studies, and to make sure your study schedule doesn't interfere with your professional or personal obligations. Find a place to study that allows you to concentrate entirely on your school work, and is free from distractions. For example, a local or school library might be better than your bedroom because at home you can be distracted by family members, the television or the Internet. Even if you plan your studies meticulously, you can still make a mistake by scheduling marathon study sessions. Schedule sessions that are no longer than an hour or two to keep from burning out. If you must study longer, take a substantial break in the middle to eat and recharge. While you might have an ultimate goal for a particular study schedule, such as passing the final exam, plan out smaller, regular goals to work toward. For example, instead of wanting to master all of Shakespeare's comedies by the semester's end, strive to learn one play each week. You don't have to bear the burden of studying all by yourself. Whenever possible, find a study buddy or study group to help you. According to Montclair State University, working with a group can keep you motivated, and having other people's perspectives to learn from can help you develop a deeper understanding of the material. 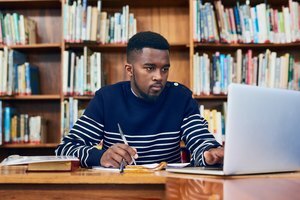 If you are attending a college or university, use the school library system, including its online databases, or any available tutoring services. Most importantly, remember that you can always go to your teacher for help with both the material and suggestions for how to study. Cascio, Christopher. "10 Study Strategies to Help Students Become Successful in School." Synonym, https://classroom.synonym.com/10-study-strategies-students-become-successful-school-11778.html. Accessed 24 April 2019.